You are currently browsing the archives for the David Hann category. The politics surrounding the MNsure crisis took a bizarre turn yesterday when a politician stated that “It’s a real breakdown in the functioning of the Affordable Care Act”, then said “I take it very, very seriously. And I deplore it.” That politician wasn’t Speaker Daudt, though Daudt had some harsh words to say about MNsure. The politician who said that the ACA was breaking down and that the letdown was deplorable was Gov. Dayton. Of course, Gov. Dayton didn’t propose a plan to fix the MNsure crisis. He left that responsibility to legislators. Whether he likes it or not, Gov. Dayton’s responsibility is that of being Minnesota’s CEO. Thus far, Gov. Dayton hasn’t shown any leadership during this crisis. The good news is that Republicans, especially Speaker Daudt and Rep. Greg Davids, are trying to solve Minnesota’s health insurance crisis. Rep. Davids, the chair of the House Taxes Committee, pictured below, just updated Gov. Dayton, Sen. Bakk, Sen. Hann, Speaker Daudt and Rep. Paul Thissen on what he’s working on. Create an immediate tax credit that applies to Minnesotans who purchase health insurance both on and off the MNsure exchange that has eligibility beyond current federal subsidies to buy down premium costs. If even one Minnesotan can keep their doctor or find an affordable alternative, Governor Dayton should put the full force of his administration behind lobbying the federal government to allow access to credits off the exchange. Amen to that, Chairman Davids. Finding solutions that let families keep their doctors and plans must be part of the long-term fix. Anything less is selling families short. The ACA guarantees the right to buy insurance. Unfortunately, the accompanying high deductibles make health care unaffordable for too many families. Forcing families to buy insurance that they can’t afford to use is immoral. It shouldn’t be tolerated. If the DFL insists on tinkering around the edges of this failing system, Republicans in St. Paul and DC should remind the state and the nation that Republicans fought for solutions while Democrats fought for salvaging a failed ideology. A to the men, Chairman Davids. It’s time to tell the federal government that their plan is a total failure and that it’s time to do the right thing by American families. Once Minnesota’s system, which will be implemented thanks to Republican leadership, starts lowering costs and providing families more choice, the rest of the nation will copy Minnesota’s model. Thus far, Gov. Dayton’s efforts have been halfhearted. It’s heartwarming to see Republicans like Speaker Daudt and Chairman Davids providing leadership in solving Minnesota’s health insurance and health care crises. It’s disheartening to see Gov. Dayton and the DFL essentially sitting on the sidelines and proposing tinker-around-the-edges non-solutions. Restore a statewide high-risk pool (like the former Minnesota Comprehensive Health Association – MCHA) to make the individual market healthier, more sustainable, and less expensive. Allow a tax deduction for health insurance premiums for individuals and families who don’t qualify for group insurance. Allow entities other than employers to offer group health insurance for their members. This would include organizations like agriculture cooperatives, fraternal organizations, clubs, etc. Allow all independent doctors, clinics, and hospitals to be considered in-network providers (as long as they meet the network qualifications). 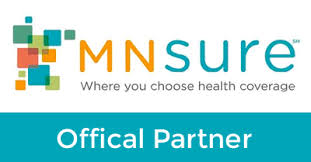 Allow individuals, families, and small employers to skip the hassles of MNsure by purchasing coverage directly through insurance agents, while still receiving the same tax credits available to MNsure enrollees. Allow Minnesotans to enroll in public health insurance programs like Medical Assistance through their counties instead of through MNsure by expanding County Based Purchasing. In the three and a half years since MNsure was created, insurance costs have shot through the roof, millions of taxpayer dollars were wasted on fraudulent applications, hundreds of thousands of families lost their doctors, and enrollment obstacles have delayed cancer treatments, even costing one woman her life. Despite all of this, Democrats in the legislature haven’t lifted a finger to fix it, or even stop MNsure executives from receiving thousands in unfair bonuses. Minnesotans need to decide: Do you want more of the same top-down regulations that caused this mess? Or do you want to lower costs and increase choices by tailoring the health insurance market to individual needs? Republicans will bring our health insurance market back from the brink of collapse by instituting patient-centered, common sense reforms. These are middle-class Minnesotans. They are getting squeezed — crushed — by these health insurance costs. That’s right. They’re getting crushed by the things that the DFL voted for. Republicans offered lots of amendments to the bill but each was defeated by the DFL on straight party line votes. During the 2015 and 2016 sessions, Republicans offered alternatives but the DFL Senate consistently stopped the Republicans’ legislation. I’ll word it differently than Sen. Hann. If Minnesotans want high premium increases, they should maintain the status quo in the legislature. If Minnesotans want real reform and lower health insurance premiums, their only option is to vote for Republicans. As usual, Rep. Paul Thissen is criticizing Republicans for the DFL’s mistakes. The DFL created MNsure without a vote from Republicans. Republicans offered amendments to the MNsure bill but those amendments were rejected by the DFL because Rep. Thissen wasn’t interested in doing what’s right. Rep. Thissen was just interested in winning partisan victories. Recall that Governor Dayton and DFL own this debacle lock, stock, and barrel. They created this mess without a single GOP vote. Of course, that hasn’t stopped DFL politicians from trying to pin blame on Republicans. This finger pointing comes in the form of demanding that the GOP help the DFL get out of the mess and find solutions to their problem. This is typical, expected, and emblematic of the shameless nature of their politics. First, DFL identifies some issue as being in need of a government solution. Two, DFL creates policy that makes situation worse. Three, DFL blames some boogie man (e.g. Big Insurance Companies) and demands GOP fix problem. Four, DFL uses the we-care-about-people-so-our-results-don’t-matter excuse. Five, GOP fixes problem. Or if they don’t, DFL blames GOP for not caring and not having a solution. Pay particular attention to Sen. Julie Rosen’s presentation 10 minutes into the presentation. It’s totally infuriating. If you aren’t upset with the DFL after watching that, then you don’t have a pulse. Putting this bluntly, the DFL is the party of failure. 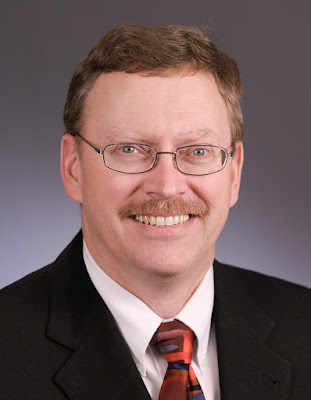 The DFL didn’t support the Sandpiper Pipeline project. Instead of providing high-paying jobs to Minnesotans, the DFL pushed those high-paying jobs away to North and South Dakota, Iowa and Illinois. Three years ago, the DFL created MNsure. Now it’s a disaster. That’s the same year that they made an historic investment in K-12 education that would keep property taxes low. I’ve written frequently how that historic investment failed, too. Property taxes are still going up. If you want failed policies in the future, vote DFL this year. That’s the DFL’s specialty. If you want things fixed or done right the first time, then voting for Republicans is the taxpayers’ only option. When it comes to dishonest DFL politicians, Paul Thissen is in the conversation. Though he isn’t at the top of the list, he’s certainly part of the conversation. Yesterday, Rep. Thissen issued this statement. To be fair to Rep. Thissen, there were fragments of truth in his statement. I would just reiterate that the bills that we had on the last day of session were compromise bills. Go back again. Look at the tape. Look at Sen. Stumpf talking about the bonding/transportation bill. He called it a “true compromise between Republicans and Democrats.” The Speaker has pointed out that half of that bill, more than half of it, had the Governor’s priorities in it. And now we’re supposedly at a point where all of those compromises are off the table and we’ve got another $243,000,000 of additional spending that we are being asked to do without any backing away from that number — an additional couple hundred million in bonding. And all of this is kind of in complete denial of all of the compromise work that had gone on this entire last session. This is what I find so remarkable. I think it is a setback. Why, after a whole session and actually going back to the session before of talking about some of these issues, to now have a bill get killed at the last minute with a request for a light rail project that no one had ever seen a hearing on and now, that becomes a must have and they say we have to start over and renegotiate everything, I think it is a setback. Rep. Thissen, why should Republicans offer additional compromises when Gov. Dayton refuses to move a square centimeter from his post-session positions? Rep. Thissen apparently thinks that Republicans should always compromise and that DFL politicians don’t ever have to compromise. It’s time Speaker Daudt and Sen. Hann turned up the heat on Gov. Dayton for killing the Tax Bill, then refusing the legislature to fix it. Gov. Dayton said he wouldn’t hold the Tax Bill hostage. I guess he meant he wouldn’t hold it hostage until he started using it as leverage in negotiations. Here’s why that’s important. Gov. Dayton wants to increase the size of the bonding bill by more than 40% over the House bonding/transportation bill. Further, he wants $243,000,000 worth of additional spending for the Twin Cities added to a new supplemental appropriations bill after signing a major supplemental appropriations bill a month ago. The SC Times Editorial Board isn’t as unflinchingly liberal as the Strib’s Editorial Board but it’s a close second in Minnesota. This editorial isn’t the worst that they’ve published but it’s still a cheerleading editorial. For instance, this editorial says “Earlier, the Times Editorial Board gave this advice to Gov. Mark Dayton: Don’t call a special session. Make the lawmakers deal with the consequences of failing to find agreement on some major legislation.” Clearly, the Times Editorial Board is picking Gov. Dayton’s side. It’s as if they’re absolving him of any responsibility for the trainwreck. Gov. Dayton isn’t innocent in all this. He’s the idiot that vetoed the Tax Bill that would’ve provided tax relief to small businesses, farmers, students with crushing student loan debt, parents trying to save for their kids’ college education and military veterans. Is the Times Editorial Board cheering this disastrous decision? That’s what it looks like. Gov. Dayton ought to know. He’s the politician who’s moving things backwards. During the session, he signed a supplemental spending bill. It wasn’t for nearly the amount that he’d originally wanted. Gov. 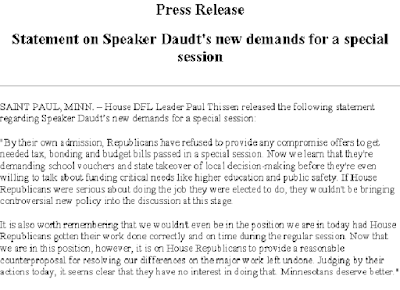 Dayton is now insisting that a special session won’t be called until Speaker Daudt agrees to give him the rest of his spending request. Dayton’s limousine liberalism and his my-way-or-the-highway negotiating style sends the clear message that he puts his ideology ahead of doing the right thing for Minnesotans. Lumped in with that is the DFL itself. 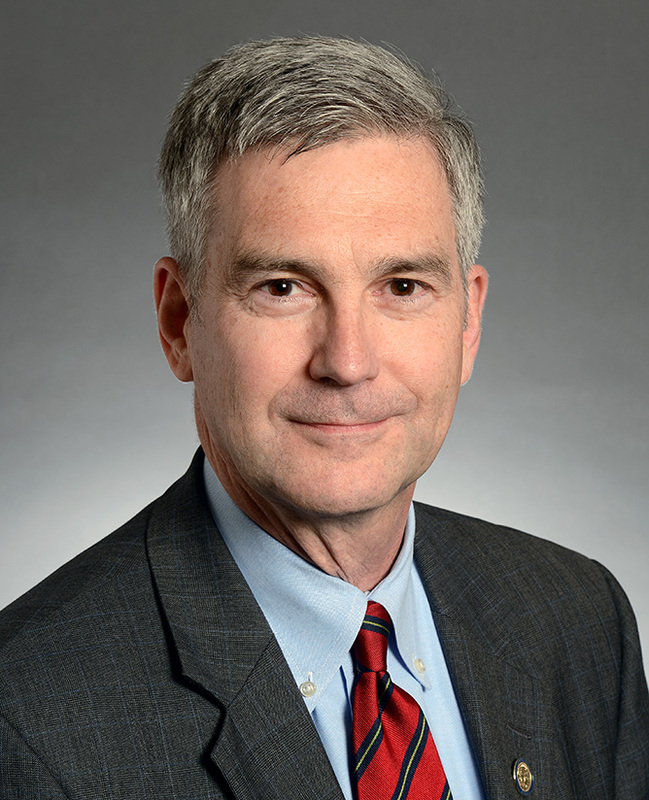 Sen. Hann noted the bipartisan nature of the bonding/transportation bill. Now Gov. Dayton wants to essentially start over and include all of his priorities while refusing to accept Republicans’ proposals. That’s what obstructionist liberalism looks like. Let’s be clear. 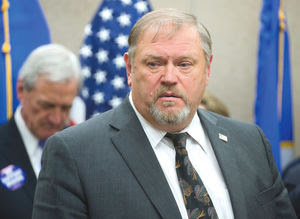 If Sen. Bakk were a profile in courage, he’d break with Gov. Dayton and insist that Gov. Dayton call a special session to fix the Tax Bill. The fact that he’s stayed silent says everything. Finally, why has Gov. Dayton and the DFL insisted on a bonding bill that funds Southwest Light Rail? Twin Cities progressives insist that it’s needed. They’ve never explained why it’s needed. That hasn’t mattered to the Times. Like an obedient puppy, they’ve refrained from asking important questions. That isn’t surprising, especially considering the Times’ puppy dog reputation. GOP winning special session fight? When this year’s legislative session ended, the CW was that the DFL held the upper hand in the PR/campaign fight. Whether that was true or not at the time isn’t relevant anymore. What’s relevant is who’s fought the smartest fight to this point. This statement hammers home some important points. 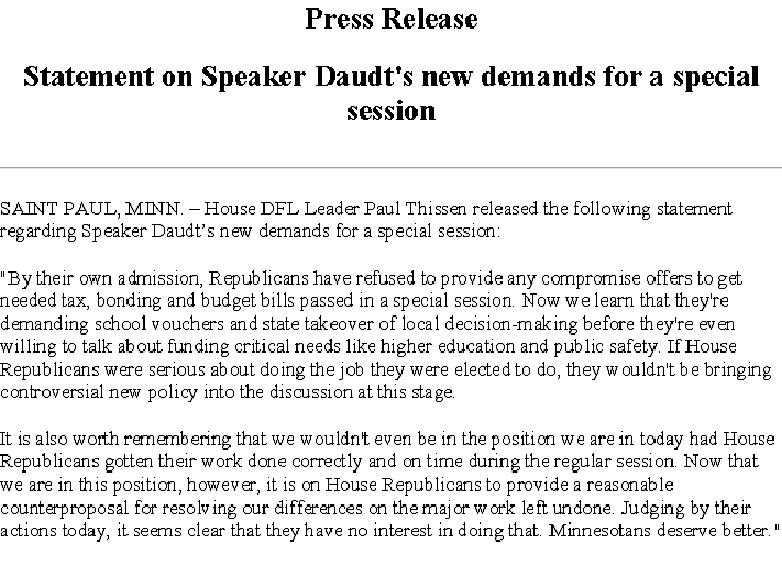 The DFL has talked solely about process, talking about the end of session. Republicans have talked about Gov. Dayton vetoing the Tax Bill, then questioning why Gov. Dayton decided to hurt veterans, farmers, college students, parents saving for their kids’ college education and small businesses. I won’t say that people don’t care about process. If I were a betting man, though, I’d bet that people care more about getting tax relief. If the DFL thinks that they’re winning that fight, I hope they keep thinking that. The DFL is also highlighting the line ‘If the Twin Cities wants to raise the money to build SWLRT, they should be able to.’ I’d agree to that statement only if the DFL agreed that the metro also paid for the annual operating deficits, too. The DFL needs to pick up seats in exurban and rural Minnesota. Arguing that tax relief for farmers, veterans and small businesses hinges on a metro project is exceptional stupid politics on the DFL’s part. There’s an important question Minnesotans should ask themselves before they head to the polls this November. Should they vote for a political party that’s owned by the special interests? If they don’t want to vote for a political party that’s owned by the special interests, then they can’t vote for DFL candidates. The child care unionization vote provides the perfect illustration of how much the DFL is owned by the special interests. On May 15, 2013, the Minnesota Senate debated the child care unionization bill for 17 hours. The bill passed 35-32, with 4 DFL senators joining all 28 Republicans in voting against the forced unionization legislation. Five days later, on May 20, 2013, the House passed the unionization bill 68-66. The DFL passed the bill despite a strong self-organized marathon lobbying effort by the in-home child care providers. When the DFL took up the debate in the House of Representatives, in-home child care providers were legion in the halls outside the House chamber. Repeatedly, these child care providers told the few DFL legislators who would listen that they’d reject unionization. That didn’t matter to the DFL. Mike Nelson, the DFL’s point person on all things unions, argued for passage of the bill. The DFL passed the bill by the narrowest of margins, 68-66. Rather than listen to the people, the DFL listened to the special interests. The bill passed. The DFL bragged about another legislative victory to go along with raising taxes and making historic investments in schools. The DFL’s victories were short-lived. Several of the taxes that they raised were repealed 9 months later. The “historic investments” in education were touted as a way to stop property tax increases. Less than a year later, school districts were raising property taxes to sustain their operating levies. We know that over the 10 years that we’ve been working on this that child-care providers are hands down overwhelmingly opposed to this. They were waiting by their mailboxes just so they could have an opportunity to vote no. Family child-care providers are small business owners. We set our own rates, we create our own working conditions, all the things that unions typically negotiate for, we determine for ourselves. The DFL listened to the SEIU and AFSCME. Republicans listened to in-home child care providers. Remember that the next time you wonder which party to vote for. Let’s remember that SWLRT funding has been controversial for as long as I’ve been paying attention to the state legislature. It’s a priority for transportation lobbyists but it isn’t a high priority for anyone else. SWLRT isn’t a priority. Fixing Highway 12 isn’t a high priority either. Fixing Highway 12 is a super-high priority project. If Sen. Skoe wants to explain why he voted for funding SWLRT but didn’t fight for important projects, I can’t wait to hear his explanation. For some reason, I’m picturing Sen. Skoe doing lots of tap-dancing during his explanation. The latest scuttlebutt from St. Paul is that Gov. Dayton will veto the bipartisan tax bill by not signing it into law. Technically, he will use a provision known as a pocket veto. In the real world, it’ll be another example of Gov. Dayton overplaying his hand. When Gov. Dayton vetoes the bipartisan tax bill, he will argue that there’s a wording error in the bill’s language. Technically, that’s true. It’s also a dodge. Let’s be clear about this. Gov. Dayton plans on vetoing a bill with tons of middle class tax cuts in it, property tax relief for small businesses and farmers and that some tax incentives that will diversify the Iron Range’s economy. He’s threatening to veto the bill if House Republicans don’t agree to include funding for the Southwest Light Rail in the bonding bill, something that they’ve opposed for years. Gov. Dayton initially said that he wouldn’t hold the tax bill hostage to get leverage on a bonding bill. Now he’s reneged on that promise. While I’m upset from a policy perspective that Gov. Dayton plans on vetoing the tax cuts, I’m thankful he’s doing it from a political standpoint. Let me explain. Gov. Dayton has undoubtedly read the articles saying he has the most leverage over a special session. While that’s true in the sense that he’s the only person who can call a session, it isn’t true in the sense that the GOP put together some very appealing legislation. The tax bill is a perfect example. That passed with overwhelming support in the House and Senate. It passed in the House 123-10. It passed in the Senate 55-12. Further, on the bonding bill, Gov. Dayton and the DFL are essentially saying that funding for the SWLRT is more important than fixing Highway 12, the most dangerous stretch of highway in Minnesota. Does the DFL really want mailers showing up telling stories about traffic deaths that they voted against. See here, here and here for stories about fatalities on Highway 12. Those mailers will be especially effective against DFL senators because they voted to stop funding for fixing Highway 12. Picture a mailer showing up in Terri Bonoff’s open seat in Plymouth that highlights her support for SWLRT at the expense of fixing Highway 12. Imagine that mailer showing up in Chris Eaton’s Brooklyn Park/Brooklyn Center district. I can’t imagine this playing well in John Hoffman’s district or in Alice Johnson’s district, either. If Gov. Dayton wants to bet that funding SWLRT is more popular than middle class tax cuts or fixing Highway 12, it’s my advice that Speaker Daudt and Sen. Hann should call his bluff. I’m betting that DFL legislators in swing districts won’t like Gov. Dayton playing hardball with those issues. 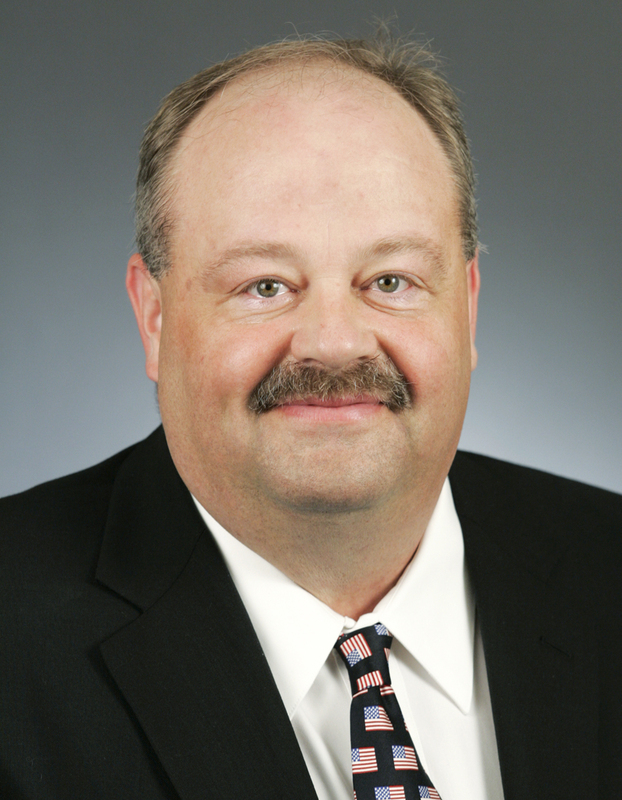 Senate Majority Leader Tom Bakk of Cook will not acquiesce to a Republican request to make public a personal email sent to a Cook County businessman regarding the Twin Metals lease issue. That’s BS. First, I’d demand to know which email address Sen. Bakk used. If he used his legislative email address or his IRRRB email address, that ends Sen. Bakk’s argument that it’s a personal email. Saying that you’re using a government account to send personal emails is a nonstarter. But in Cook County, there is also an undercurrent of an Iron Range Resources & Rehabilitation Board issue — should Cook County continue as part of the Taconite Relief Area and receive agency funding. I can’t wait to hear Sen. Bakk explain how threatening the Cook County commissioners with cutting off funding is “personal.” As I said earlier, I don’t doubt that Sen. Bakk wanted to keep his threatening email private. I hope that Sen. Hann has another plan to force Sen. Bakk into producing that email. Private citizens shouldn’t have to deal with threats from public officials. That’s what Sen. Bakk did to Mr. Rysdahl and to the Cook County commissioners.